Ah, thanks for the reminder: I updated the readme, but forgot to update this page. As it now reads above: Note that version 3.0.1 of Twitter has a bug that prevents it sending the username and password. For this version, you must use http://your-blog.com/twitter-image-host/upload?username=YourTwitterName&password=YourPassword, at your discretion. 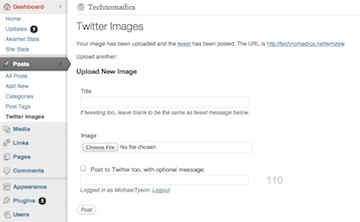 Version 0.5.7 of Twitter Image Host now supports this. Hello Lucio – thanks! It’s getting there, gradually, but as you’ve discovered, it’s not perfect yet. Ah, bugger; It may be a compatibility problem with the new WordPress version. There are still a few glitches with comments; I’ll take a look at it again soon. A solution may be just to save posted images as ‘asides’ in WP, rather than to ’emulate’ posts, as currently happens. It may be a little while until I have a solution (until then it may be worthwhile just disabling comments, perhaps linking to Twitter for replies via Twitter instead? I got an error if i try to post an image via tweetie (twitter for iphone). The following error appears: “Error uploading attachment. There was an error posting your message. It has been saved as a draft, please try resending later. (Error: could not post image). Have you got an idea what i’m doing wrong? hello Michael, thank u for answering. Waiting for the next realease of the plugin, could you tell me in which line of the file called “twitter-image-host.php” i have to copy the line ‘ATastyPixel’, ‘columns’ => in order to make the plugin show all the images i have published like thumbnails in a table? i have another question: could be possible in the next realease to show the message sent to twitter too? many thanks u, the plugin is great and thanks to everyone (first you) will be fantastic! Actually, it looks like you’ve got the wrong piece of code there – see ‘Using Template Tags in a Loop’, above. OMG why is this so difficult for me. I followed the directions. There was no twitter-image-host directory set up so I manually made the folder. All the files are under the wp-plugins directory but I cannot access even the upload forms? Heck, I can’t even access any part of the plugin? What part of the directions am I getting wrong because I followed them directly. I can make the folders 777 but that won’t change anything?! Please please help me I got the latest version of wordpress btw. Good news is I got it uploaded and working. “There was an error posting the image: Unauthorised Twitter account” I checked my username and password 50 times and it works on twitter. Any suggestions? Hey! How did you solve it? What kind of mistake did you make? Same here. Though i can see the upload-form, the images don’t go through… Can anyone help me out? Have you added your twitter name to the list of allowed accounts, in plugin settings? Wow, this is great. I’m definitely planning on adding this to my blog since I’m pretty active on Twitter. This is just what I was looking for… Wow! Oh wait, it works great with the Automator settings but I can’t see the uploader at http://myblogurl/twitter-image-host/ I just get a white screen with nothing in it. Any ideas? And how do I delete images I have uploaded? Ok I know how to delete images… but I’m still struggling with the uploader. I’m not sure what could be happening, Oscar. Do you see anything in your server’s error log? Did the plugin break with the Oauth changes Twitter implemented on Aug 31? Things were working fine on the 30th. I can’t get my posts to show on Twitter, although the images do post on my blog. Another of my Twitter plugins also seems to now be unable to post to Twitter. Almost certainly, Mark =) Thanks to Twitter of course, for giving us… negative two days warning that they were going to implement a sweeping change to their API. Bastards! I’ll see if I can fix it soon. One of my other Twitter plugins (Twitter Tools, I think:) recently implemented the “your blog as a Twitter application” thing, where you create consumer keys and access tokens and such, and it seems to be working fine. Probably the direction you’ll need to go? Of course checked many times, account name is registered in settings.. Sorry about the delay, Luke; This is due to Twitter’s rather abrupt API change. I’ll get a fix out as soon as I have a moment. Until then, you can still upload images – but you’ll need to actually post the tweet on twitter.com, or from your Twitter client. So have you sorted this from Sept 2010???? What do you mean by “Until then, you can still upload images – but you’ll need to actually post the tweet on twitter.com, or from your Twitter client.”???? Great plugin, just what I was looking for to move away from image hosting sites and get everything on to my own sever. I may be missing something but, when I post from twitter, it posts no problem as you can see http://picturesby.michaelrawlins.co.uk/2mjc3/ but, and it seems to be quite a big but, the post doesn’t appear on the front page, in fact although the post is there, it doesn’t seem to exist within wordpress. It is not listed under posts or pages and the media is not listed anywhere. I have also had problems leaving comments on this post. I enter a comment and press submit and I just get returned a blank screen. That’s right – the plugin doesn’t actually create posts: It just simulates them in order to make templating easier. If people want, I may change this behaviour in the future and make it actually create entries. A side-effect is that comments don’t work very well – I haven’t had the time to look at it in-depth, unfortunately. Thanks Michael, I had sort of worked that out after posting. I’ll hack away at the templates to take the comments fields out and it should be ok. Personally I would love it as an option to have the tweet created as a post.. I second that request, would be great if these actually created posts when you submit an image. Right now this plugin is about 90% of what I was looking for; that functionality would push it to 100%! By the way, nice work on the documentation here. It’s refreshing to see a WP plugin help page that’s actually useful! I don’t know how they did it. But it seems very good. I was just curious if you were planning to update the plug-in to work with OAuth? Love the plug-in. I’ve been looking hard to find how I can use bit.ly to shorten the url when the picture is uploaded. My domain is a little to long for some of the tweets I send. I would also like to use to bit.ly to gauge the clicks I am getting on the pictures. Any idea how I might do this? Thanks a bunch. Again great job. Any plan to further develop this plugin? Its great! I would like to see some further enhancements and bug fixes! Image Upload via Snow Leopard and the Automator service works well – except that the script does not copy the url to clipboard (always empty). Any idea on that? Thanks a lot for the awesome plugin! The comments don’t work for me and I got rid of the comments box by editing the twitter-image-host.php file that’s in the http://www.yourdomain.com/wp-content/plugins plugins folder. I don’t know if this is the right way to do it but now it get’s rid of the comments box on the tweeted picture page which is what I was looking for. Oh oh, and now I notice the allow comments and trackbaks button in the admin section… DUH! Great plugin, but I have an issue regarding image size. When i post to my site using twitter, the image displayed is too large and spills outside the page, therefore cutting off part of the image. Is there any way of ensuring posted images resize automatically? I would also like this. After the new Twitter for iPhone app stopped supporting custom image options, I’ve tried out a few others that do, including Tweetings and Twittelator. I have been using the Tweetpress WordPress plugin quite successfully with the old Twitter for iPhone app, and it would resize my images to 1024 x 768 at some point before it was uploaded. Neither Twittelator nor Tweetings appears to resize the image, so I end up with my iPhone trying to upload a 2mb+ image, in 2592 x 1936 resolution. Which is near-useless to me. My temporary workaround is to email a picture to Flickr, which is linked-up to create a new post on my WordPress blog. Then dlvr.it scans my website, notices a change, and tweets it. The delay between me emailing Flickr, and a link being tweeted is 5-7 minutes. Which is crap, but I can’t currently find any other way of uploading a reasonable (NOT enormous) sized image that results in a link to my own website being tweeted out (and doesn’t require yet another app to resize the image first). It seems as though the plugin has stopped working after an upgrade to WordPress 3.0.5. Anyone having the same issue, and is there a resolution? How much effort is involved for you to tweak this plugin so that a user no longer needs to pass their user/pass as plain text over the network? I have Twitter client 3.3.1 and get “there was an error posting your tweet. It has been saved as a draft, please try resending later. (Error: Could not post image)” . I got this error before I created the upload folder with write permissions. Easy to overlook… did you cover that? Neither of them solved the problem. Doh.. I didn’t allow for my account to upload. That was my fault. Need to make sure to go into twitter hosting settings in wordpress panel so my account can upload. Next challenge: making sure images pull up in twitter apps like they do with twitpic. Is this possible? If I understand your question, yes. It works just like TwitPic. and any pics I attach to a tweet creates a short URL on my domain, and publishes it all to my Twitter timeline. Now, I did modify the plugin a bit… I don’t like sending my user/pass as plain text over the network, so I send a hash that gets that info from the database. Got everything working within an hour; using the latest version of this plugin and WordPress 3.1. The server having write permissions on ‘twitter-image-host-content’. That’s where the plugin looks, I believe. Unless you modified the scripts. Side note; I’m compelled to discourage you from 777 permissions on a public folder. It can be risky. Start with that to test your app, but then try it with 775. Your user group should be able to write to that folder without allowing the world to as well. I’m getting a 404 error, there – it looks like you haven’t configured WordPress to use URL rewriting, which is required by the plugin. I am trying to get this app working and everytime I send a picture from the twitter.app on the iphone it gives me an “error:not found”…any thoughts? I have been using this no problem with the Twitter for iPhone app, I have now changed to the new version of Tweetbot which now supports custom image hosting but I keep getting an error when posting. I have tried using the two different ways mentioned above. Is there another way to get this to work? Love TIH and have been using with Twitter on iOS, but now have left that client as they continue to remove functionality. Moved to Tweetbot which has support for Custom APIs but the same TIH upload url doesn’t work for Tweetbot. Any ideas? Tweeks? The image uploads to TIH but doesn’t pass the link to the uploaded image back to Tweetbot. So, the tweet in TB generates an error on the image post.